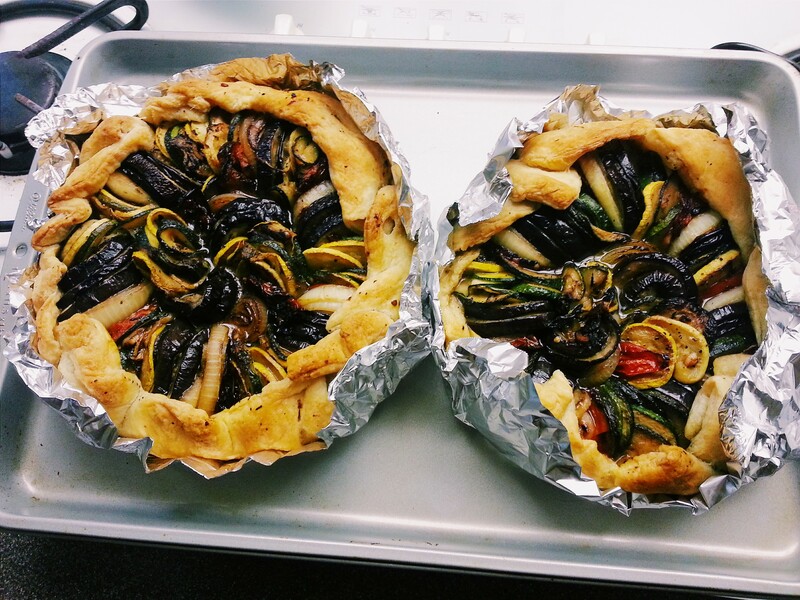 I went on a ratatouille galette making spree back during Thanksgiving but never shared it! It was a HIT with my parents and my boyfriend’s family. I’ve also made this MANY times since then, for pot lucks or any other occasion that calls for a veggie side dish. What is great about this recipe is that it compliments almost every entree without stealing the spotlight, but it could also be a showstopper itself. The original recipe that I adapted mine from was on Taste Book, but since I can’t find it anymore, so this is IT! Prep Time: It takes a significant amount of time to saute and roast the veggies, so I started prepping these things ahead of time. Then when it comes time to assemble and bake, you aren’t as pressed for time or exhausted. Eggplant – Cut the eggplant into 1/2 inch circles. Cut the circles in half. Place onto a plate with a paper towel. Sprinkle salt over the slices to pull out the water. Wait about 10 minutes, pat them dry, flip them over and repeat on the other side. Tomatoes – Cut the tomatoes into 1/2 inch slices (4 slices per tomato). Oil a baking sheet. Place the tomato slices on the sheet, drizzle olive oil over them. Salt and Pepper. Roast in the over for about 20 min, until the edges are a little caramalized. Onion – Cut the onion into 1/2 inch slices, like the eggplant. If you want to cut them into 1/2 inch rings, you can do that too. Herbs – If you’re using fresh herbs, chiffonade them. Puff Pastry – Take it out of the freezer 30 minutes before you plan on baking, so it has enough time to thaw. Eggplant – You can roast the tomatoes first, while the eggplant is getting the water sucked out of it. Put oil on a baking sheet, arrange the eggplant slices onto the sheet. Drizzle more oil on top, salt, and pepper. Roast for 20 minutes, they should be soft and sometimes a nice crust on the bottoms. Tomatoes – Put oil a baking sheet. Place the tomato slices on the sheet, drizzle olive oil over them. Salt and Pepper. Roast in the over for about 20 min, until the edges are a little caramalized. Onion – Saute until nice and caramalized. Squash – Saute until they are soft but not mushy. Unfold the puff pastry, you can use a rolling pin to make it thinner and bigger. Grease a round baking dish or fashion one out of foil. Place the puff pastry in there and press down. I poked some holes in the bottom of the puff pastry.. just cause. Mix cheese, herbs, garlic and (optional) truffle oil together, and spread it out on the bottom of the pastry. Assemble your veggies! You can spiral them in whatever order you feel like. Fold the edges of the pastry up. Beat egg, and paint the puff pastry with the egg wash.
Bake at 425 degrees for 35 minutes – you’ll know its done when the top and sides are crispy. Sometimes you can even shake it, and it will come loose. Add more or less time as you see fit. Before baking! 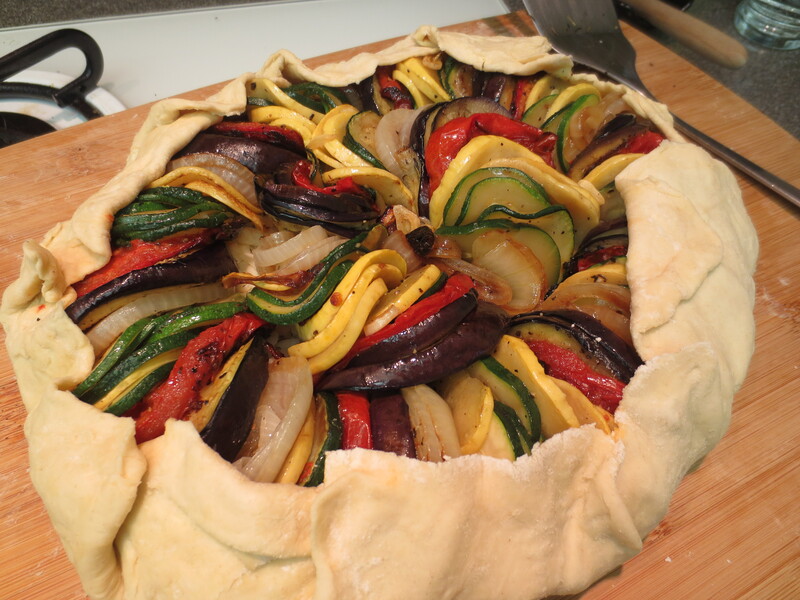 Ratatouille Galette. Don’t make the mistake I did, assemble it directly on foil on a baking sheet or foil in a round cake pan.